Norwegian Krone (NOK) is the currency of Norway, which belongs to countries with market economies. The Norwegian Krone is part of the so-called Scandinavian group: NOK, SEK (Swedish Krone) and DKK (Danish Krone). The economy of Norway is largely represented by the oil and gas industry, which makes the Norwegian Krone a commodity currency, that depends a lot on the cost of oil. Norway also has large natural resources, confirming the dependence of NOK on the value of raw materials. Norway has developed shipping due to geography. At the same time, the share of the agricultural and industrial sectors is reduced, which compensates by the services sector. 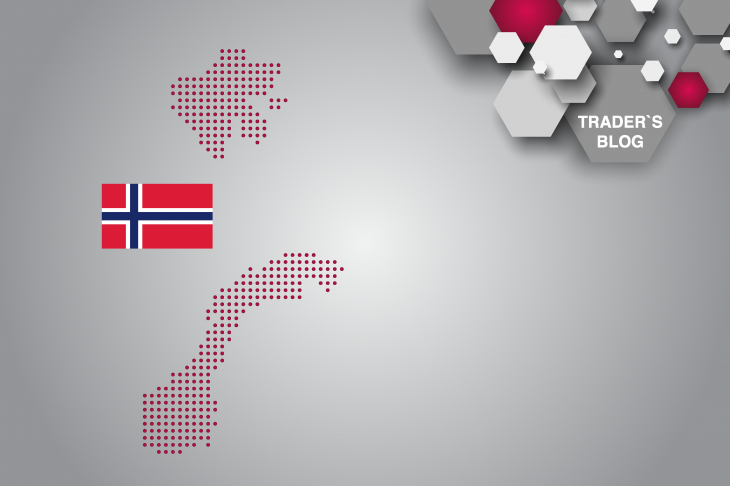 State sector in Norway is the largest in the world, which allows supporting a developed social system. and a high standard of living. Norway’s GDP growth rates in recent years remain very positive, despite some slowdowns, that are mainly related to oil prices changes. At the same time, on average this indicator is much higher than in the euro area. Since the Norwegian Krone (NOK) is a commodity currency, it has a high degree of correlation with BRENT oil, which allows you to monitor the dynamics of pairs with the Norwegian Krone in the general trend of oil prices. The chart above shows an example of the movement of the USD/NOK pair (Japanese candlesticks), BRENT oil (blue line) and EUR/NOK pair (red line), which shows a direct correlation between oil and Norwegian Krone. As it can be seen from the table, the Norwegian Krone also has a high degree of correlation with other currencies of the Scandinavian group (in this table an example is given with the Swedish Krona (SEK)). This allows you to trade unidirectional currencies. It is worth noting that the Norwegian Krone has rather high volatility, which must be taken into account in money management and when placing protective orders. At the same time, the Norwegian Krone is an excellent commodity currency, that can be analyzed with technical analysis, that shows itself well in longer timeframes. Norwegian Krone is not recommended for trading for traders-beginners due to high volatility.